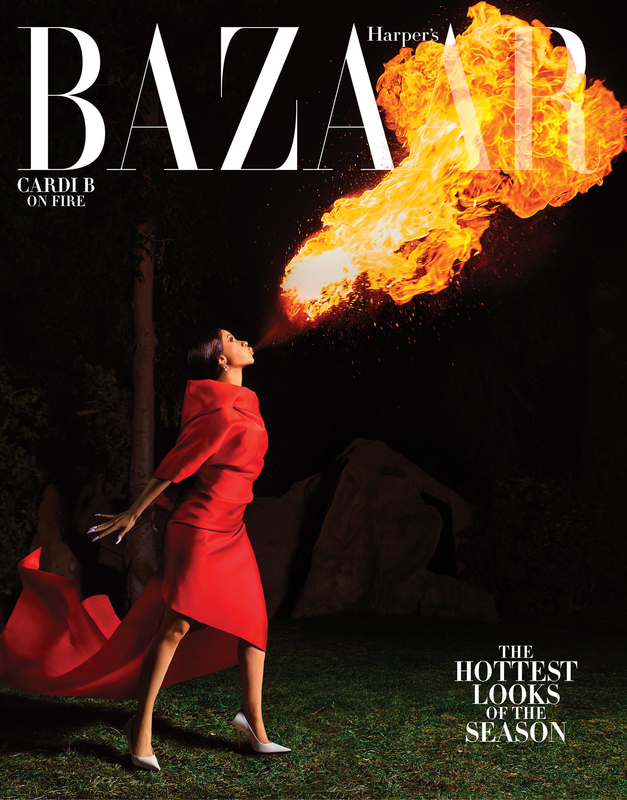 Cardi B on Thursday morning broke the internet when Harper's Bazaar released a set of stunning, fairy-tale-inspired images from the rapper's recent interview with the magazine for its 2019 spring fashion issue. In it, Cardi opened up about adjusting to being one of the biggest stars on the planet and her rocky relationship with husband Offset of the rap group Migos. But she also revealed she had experienced postpartum depression after the birth of her daughter, Kulture Kiari Cephus, in July. “I thought I was going to avoid it,” Cardi told the magazine. “When I gave birth, the doctor told me about postpartum, and I was like, ‘Well, I’m doing good right now, I don’t think that’s going to happen.’"
"But out of nowhere, the world was heavy on my shoulders," she said. According to the American Psychological Association, 1 in 7 women experience postpartum depression. Some symptoms of the disorder include fear of not being a good mother; racing, scary thoughts; and anxiety or panic attacks. Cardi said she hasn't hired professional help because she feels she can't trust anyone outside of her family. She also said her post-baby body still feels alien to her in some ways. “For some reason, I still don’t feel like my body’s the same,” she said. While Cardi addressed some difficult topics in her interview with Harper's Bazaar, many people on the internet were also enamored with the aesthetics of her photos for the magazine, which were shot by Mariano Vivanco. There was no shortage of comparisons when it came to her Cinderella homage and the incident from last September, where the star was escorted from a — and you can't make this up — Harper's Bazaar icons party after getting into an altercation with fellow rapper Nicki Minaj. "We stan a multifaceted princess," one person said. We stan a multifaceted princess. Cardi B covering the March 2019 issue of Harper’s Bazaar | Cardi B leaving the Harper’s Bazaar Icons Party, September 2018. Others remarked on her showing off her long locks with her take on Rapunzel. Casting Cardi B as Rapunzel with the Bundles is honestly iconic. Though Cardi's life is very much a rags-to-riches story, she said she's not caught up in the hype of fame. “Before, I cared about everything — relationship, gossip. Now I don’t feel like I have the time to please people,” Cardi said.